3A Result provides your audience with live detailed results during the competition. When the scores are announced inside your venue we can provide detailed scoring information to everyone around the world with an internet connection. What is 3A Live Results? It is an online app designed to create a higher level of engagement with all people interested in figure skating competitions. This includes audiences at the venue but also everybody else around the world. Think of family and friends not able to come to the competition but still wanting to know what is happening. And let's not forget the many skating fans around the world. 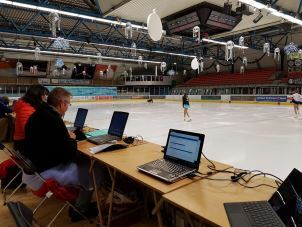 Of course the skaters and coaches at your competition will also be thrilled to instantly get detailed feedback about the program they just skated. It will give everybody the chance to instantly see how the decisions of the panel created the total scores and what it was in the program that made the difference between 1st and 2nd place. Everybody watching the website with our live results app will have their experience of your event enhanced. This will help promote your event and make skaters, coaches and spectators want to come back next year. Because of the global online reach of our site you can increase your reached audience many times over. If you have sponsors they will benefit greatly from the increased engagement and enhanced experience of everybody that is interested in your event.